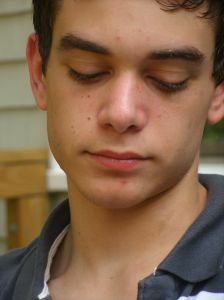 Causes of Teen Depression: What Are The 3 Most Common? "Causes of Teen Depression: What Are The 3 Most Common?" The three most common causes of teen depression have to do with unhealthy lifestyle choices. Lack of exercise, a diet full of empty calories, and excessive alcohol and drug use will bring on depression or make your existing depression only get worse. When you look at your typical day, how much do you move around? Get out and move even if it’s just for a walk! Exercise is a huge mood booster. If you’ve taken our e-course, you are already aware that studies show that exercise is more effective than antidepressant treatment. (And the side effects rock! Rock hard muscle!) All it takes is exercising as little as three times a week to lift the symptoms of depression. Daily walks of thirty minutes or more are even more effective. Sitting around the house only brings your mind into depression. So, get out and move. Take your dog for a walk or your neighbour’s dog! Poor eating habits is only asking for disaster with your mood! Junk food and sugary snacks will cause rapid changes in your blood sugar, giving you a temporary “high” followed by a crash. It’s the same with drinking pop or soda. If you aren’t eating enough produce, lean protein, and complex carbohydrates, you probably aren’t getting enough of the nutrients your mind and body need. You’re probably not getting enough vitamins and minerals which will cause your depression. If you lack folic acid and vitamin B-12, this can cause depression too. If you don’t eat fruits and vegetables, you won’t get enough vitamin C which will cause fatigue and sadness. So eat up those apples and carrots or branch out and discover kiwis and celery! Celery’s good with peanut butter, hmm. If you lack amino acids, this can also cause depression. SAMe is an important amino acid that gets low in some depressed people. SAMe supplements are sometimes used to treat depression. Tryptophan is another amino acid that is sometimes low in depressed people. A supplement (which I used to wean off of Paxil) called 5-HTP helps increase your tryptophan levels and lift your mood. Of all the causes of teen depression, this one is the most tragic. This is where you can spend money only to destroy your mind. When you step back and think about it, it makes no sense. Okay, you may abuse alcohol and drugs in an effort to self-medicate and ease your pain of depression, but substance abuse actually causes depression. Excessive marijuana use can also lead to depression. Finally, although “uppers” such as amphetamines and cocaine initially stimulate the nervous system, when the effect wears off depression sets in. So, it’s best to stay away from the substance abuse. Drown your sorrows in poetry or something else way more creative and productive. It’s good therapy! These three most common causes of teen depression can easily be reversed! If you haven’t already, take some time to sign up for our e-course to get some encouragement and step by step action plan to turn your life around. "Teen Depression - One Girl's Story"
A drug and alcohol treatment center is dedicated to helping addicts recover from all the damage drugs have wreaked on their lives.